Texas Motor Speedway RV Vacations - RV Rentals Dallas - Southwest RV Rentals - Luxury RV Rentals in Dallas - Ft. Worth with Unlimited Mileage! 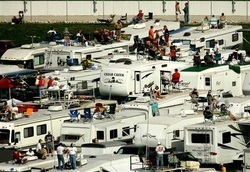 Grab your buddies and head down to Texas Motor Speedway in Ft. Worth in one of our Luxurious Campers or RV's. You'll have the Experience of a Lifetime at TMS in one of our State-of-the-Art Lavish RV's. They boast indoor and outdoor TV's, Plush Seating, Fridge's Restrooms, Comfortable Sleeping, Ovens, Microwaves, Huge Awnings, and more! You will be living in Luxury in the center of the Race Track at Texas Motor Speedway. Our Campers and RV's are built with ample space to Recline and Relax. If you don't feel like being outdoors, you can kick back on the sofa or bed and watch the pre-game on one of the many TV's with Surround Sound. RV's and Campers rented from Southwest RV Rentals stand out among all others. Not only are they properly and frequently maintained and cleaned, but when you rent with Southwest RV Rental in Lewisville, you have unlimited mileage! So if you want to take a road trip after the Duck Commander 500, you're free to. No matter if you are traveling 50 miles or 5000 miles, the cost for your Premiere RV rental is the same. Texas Motor Speedway has been hosts to the NASCAR Sprint Cup Series, the NASCAR Xfinity Series, and the NASCAR Camping World Truck Series. Additionally, TMS hosts the Duck Commander 500, AAA Texas 500, O'Reilly Auto Parts 300, Verizon Indy Car Series, WinStar World Casino & Resort 400, and the Firestone 600.